A dog’s ancestral diet looked very different from the diet that has been made popular by pet-food manufacturers. Carbohydrates are NOT nutritionally necessary in a dog’s diet. Protein and fat ARE essential components for a healthy canine diet. Carbohydrates are NOT bad for dogs – in fact, when provided in appropriate quantity and from an appropriate source carbs can provide a useful source of energy and nutrients. Grains are, however NOT an appropriate source of carbohydrates for multiple reasons as you will see further below. Why Are Grains Included in Processed Dog and Cat ‘Food’? Are cheap to buy compared to the cost of good-source protein. The inclusion of grains in dog and cat food is not for the benefit of a dog’s and cat’s health. I will cover some of the impacts on your dog‘s, cat’s health just below. The negative impacts of grains in your dog’s and cat’s diet are many, some are complicated. I will not cover all impacts here but will cover enough for you to see just how serious this issue is. Many of the grains used in commercially manufactured dog kibble are processed grain (cereal) carbohydrates. These are highly digestible, low nutrient, high bulk ingredients which the dog’s digestive system quickly converts to sugar, which in-turn spikes the amount of insulin in the dog’s and cat’s system – over working the pancreas and resulting in a feeling of constant hunger. As the dog (cat) is constantly hungry (due to high-insulin levels) the dog’s and cat’s human may continue to feed the dog (cat) more of the grain-heavy food which then results in excessive weight gain – a condition on its own that can cause massive health issues…stress on joints, diabetes, inflammation leading to cancer, etc. Unfortunately all too often a veterinarian will then recommend a low calorie high fibre kibble (invariably grain based but expensive i.e. Royal Canine or Hill’s Science Diet) which further exacerbates the problem. Statistics recorded by veterinary organizations from the 1950’s up to present day are very telling. In 2005, 50% of older dogs dies from cancer, and the number is on the rise. The cereal by products used in the manufacturing of many dog foods are derived from the leftovers of human food processing. It is important to understand that these are remaindered end of the line substances and as such, they can be full of chemicals. If the grains/grain derivatives are not from human grade sources they are very likely to contain aflatoxins. Aflatoxins cause liver cancer. Aflatoxins grow mainly on grains but they also grow on legumes – like peanuts, walnuts and pecans. This is one reason why you will hear some people say do not give your dogs peanuts. Actually it is fine to give your dog peanuts or natural peanut butter – as long as you are using human grade product. 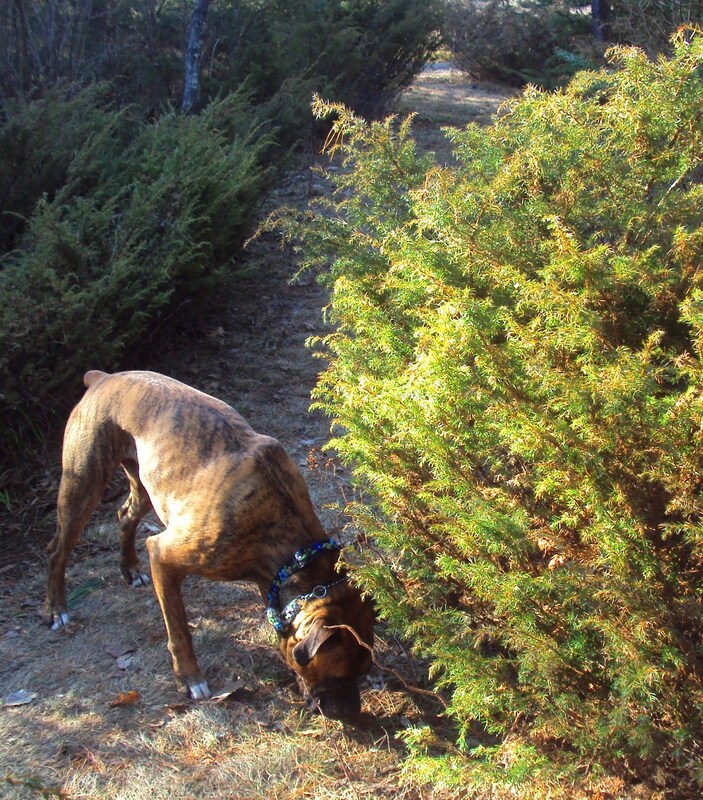 Other nuts such as walnuts and pecans are toxic to dogs, regardless of whether they are human or animal grade. Aflatoxins can also be found in cottonseed oil, fish meal and peanut oil. Human grade foods are monitored closely for aflatoxins – if present the raw product (i.e. grain) is not allowed to be used in human grade food production. There are no such regulations for animal grade foods so most commercially manufactured animal food (dog, cat, bird, etc.) will contain aflatoxins. While the body can usually detoxify small amounts, constant ingestion of aflatoxins is not manageable and therefore causes toxic loading. The majority of corn and soy grown in North America are from Genetically Modified Round-up Ready seeds. GM corn has now been proven to cause the growth of massive tumours, organ damage and death. All of the long-term effects of eating GM food is not known. In addition, large factory farms in North America use a method to process soy that creates very high levels of photoestrogens and phytates in the resulting product. Phytates interfere with the normal function of enzymes required to digest protein. Herbicides and pesticides – another thing to keep in mind , the grains used in many pet foods are purchased for their low cost not for their quality. Crops for this market sector are grown based on high yield and that is usually accomplished with the profuse use of pesticides and herbicides – resulting in more toxins and carcinogens ingested by your dog. Grain is the harvested seeds of grasses. 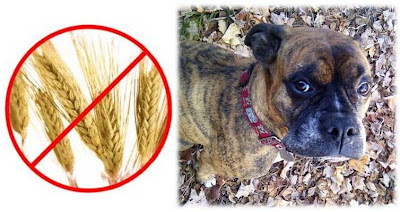 Large amounts of grains are not part of a dog’s ancestral diet. 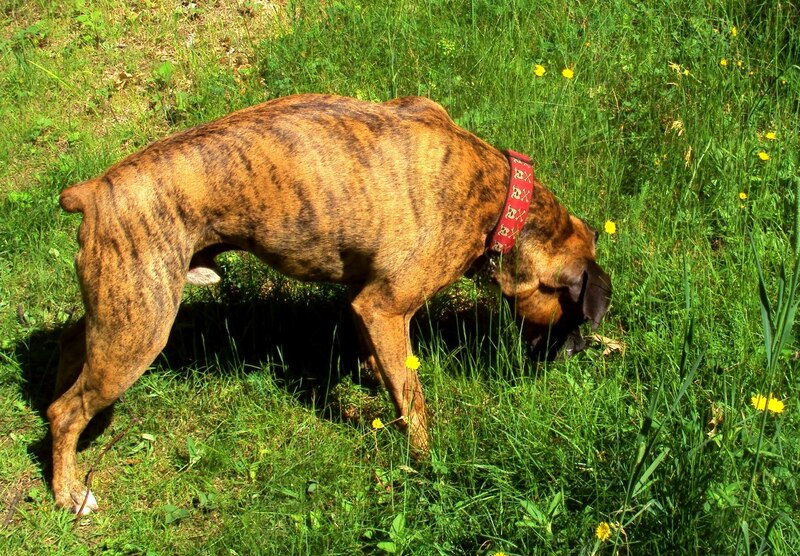 Yes our dog’s ancestors did eat small amounts of grasses – as do present day domesticated dogs; but they (our dog’s ancestors) did not consume large amounts of the seed of the grass – the grain. 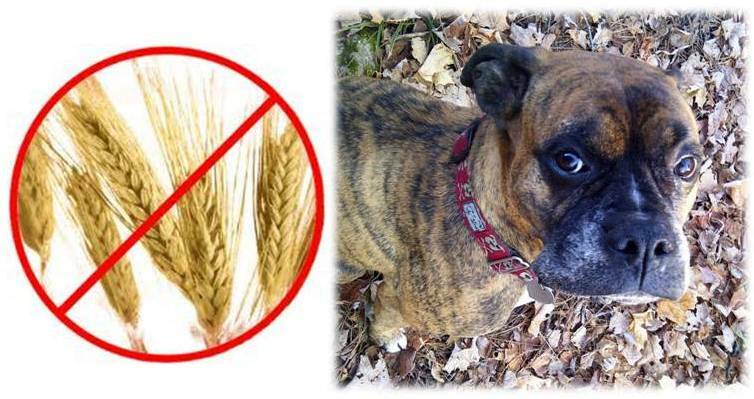 The number of dogs today developing and living with gluten hypersensitivity is epidemic. One of the ailments of gluten hypersensitivity is Candida (overgrowth of bad bacteria in the GI Tract). Overgrowth of bad bacteria is an assault on the dog’s immune system and is a common cause of yeast-based ear infections – that can become chronic and debilitating; yeast-based skin infections located at the paws; leaky gut syndrome, chronic diarrhea and more. High grain content is used when making processed pet food – to create volume at the lowest possible cost to the manufacturer, which serves profit while creating serious gaps in a dog’s nutrient intake. Compound this with the many other ‘indiscretions’ (i.e. fish meal, low levels of Omega-3 fatty acids, poor source protein) adopted by pet food manufacturers in the production of dog food and your dog’s health is in serious trouble. Did you know that 10 of the top 10 reasons for a veterinarian visit can be directly related to inappropriate diet and exposure to ingested, inhaled and topically absorbed toxins – plenty of which are found in commercially manufactured dog and cat foods and treats. 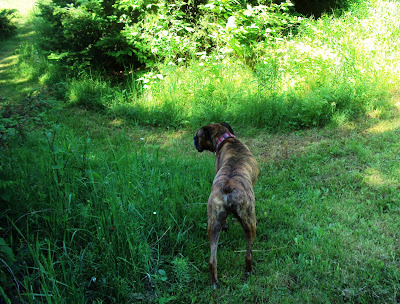 What Are Appropriate Sources Of Carbohydrates For Dogs? Fruits and vegetables can also be a great source of carbohydrates;For a comprehensive list of fruits and veggies that are good for your dog you can read more here. If you would like to try making a homemade dog food that is rich in nutrients you can read more here. If your dog or cat is suffering from renal issues you need to avoid phosphorous in his/her diet, so no legumes (as legumes are high in phosphorous), use squash and sweet potato for carbs. Hi Cynthia read the section of the article before the ingredients – the fore section explains amounts to feed. I’m new to your blog, and am wishing either I lived in Ottawa or you lived in Arizona! I Googled my way here looking for homeopathic/holistic help for itchy paws on my 2 yr. old Bouvier/Poodle mix Stella. I have ACV and peroxide on hand so the soak comes tomorrow. Thank you ahead of time! But tonight I’m curious about your thoughts on diet. I’ve read a few mentions of “species appropriate” foods and was surprised to see you write that dogs are omnivores. Canines are carnivores, they live with humans who are omnivores, but the species canis familiaris are carnivores. I don’t think any canine in the wild would be eating apples, pears and carrots. Maybe bacon wrapped apples, pears and carrots? The statistics you mention on the rapid decline in dogs average lifespan make me hope I’m doing the best I can for Stella. I feed her raw meat, bone-in chicken, beef, pork and organ meat. It costs me about $2.00 on average per pound.I don’t want to sound preachy, but dog’s eat meat. Their compact digestive system, their teeth and jaws are designed to rip and grind, lysine in their mouths to protect them from bacterial issues, even to the social importance of feeding as a pack member , all speaks to the importance of meat in dogs diet. I have read that unless starving, wolf pack won’t eat the contents of their ruminant prey’s stomachs. The stomach lining yes, but grains and grasses, no. ‘Carnivore’ refers to a living organism that obtains most( and in some cases all) of its nutrient requirements from animal tissue. Domestic dogs, unlike cats – are not considered to be obligate carnivores. Dogs should NOT be put on a vegan diet as to do so defies the natural requirements of a dog – including domestic dogs. Dogs have lived and evolved with humans for 30,000 years – our companion dogs are domesticated dogs – not wild dogs. Domestic dogs are omnivores in the sense that they are accustomed to (over the many 1000s of years) eating foods other than animal flesh. However in recent times the pet food industry has taken that to an extreme that is very dangerous for a dogs health. Is a raw food diet better than a cooked or processed food diet? If the raw food is comprised of meat obtained from antibiotic, steroid, growth hormone, GMO corn fed cows I would not consider that diet to be wonderful for the dog – that is not the type of meat that a dog in the wild would eat either :>) In addition, animal flesh obtained from factory farms is high in Omega 6 fatty acids and low in Omega 3 fatty acids. Even a dog on a raw food diet should have that diet supplemented with certain key supplements such as Omega 3 fatty acids, probiotics (I prefer real food source as opposed to supplement form), they can also derive immense benefit from certain vegetables, fruits and herbs. My dogs will often choose to seek out and pick their own fruit (i.e. wild or cultivated berries, tomatoes, etc.) and even herbs such as juniper berries. Dogs self select to eat grass in small often daily amounts due to the beneficial enzymes in grass ( you can read my article on that). But given a choice will NOT eat the seed of the grass – which is the gain. In places like South Africa they will eat the leaf of a certain plant which contains the same enzymes as the grass found on many North American lawns and meadows.